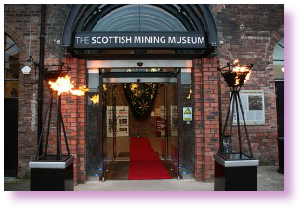 ﻿ Wedding DJ - See our Scottish Mining Museum Feature Page. The Museum is a very popular venue and ideal for all types of Events. We have played at this venue many times over the years. Our System 1 is ideal for the Museum - the perfect balance of sound and light. And with our highly experienced DJ, we would be perfect for your Event! We offer a 5% discount on our base price for Events at this venue all year round! !